Was just food shopping and found a gigantic lobster (10 pounds) in a tiny tank at a Pathmark. Yes, this is a very strange e-mail but, is there any place that you know of down the shore where this very old guy can be released. Somewhere that he/she won't get trapped again. I can't imagine how old this lobster is but I would be willing to pay his/her bail to release it. They said it would be about $65, and worth every cent. Its been in the tank since 6/21. If you know of anyplace or anyone who knows of someplace or anyone with a boat that could take it out and let it go....please let me know. That is so nice of you to try to save that lobster! I would even help pay for his release if you are able to find a place for him. I always feel bad for those poor things. If you do find a place please let me know for future reference. Ps. My mom had mentioned that usually those lobsters are raised on a farm and won't survive if just released in the ocean (i didn't think of that) she suggested to contact PETA. Let me know what happens. Thanks for offering to help the old lobster but the situation isn't looking good. I was so happy last night, I did find someone going up to Maine on Friday and would have hired a boat to go out onto the ocean with it. Problem is, I consulted with a marine biologist and he said that even though it is a nice thought, unless I knew exactly where this lobster was taken from, leasing it could be a problem for other lobsters. 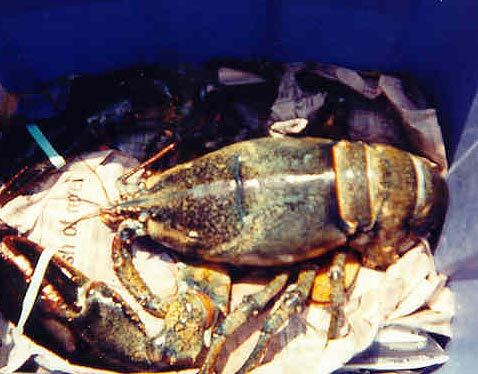 Different waters/different lobster groups have immunity to certain lobster diseases and putting an "unknown lobster" into a strange group could risk alot of other lives. The only hope is to find a good aquarium to take him as a speciman. I have an e-mail out to the NJ Aquarium in Camden. Don't know of any others in NJ. Freedom would have been great, an aquarium life (?). Being boiled to death would be so disgusting! Will let you know. If you think of anything....let me know. Your as bad as me when it comes to saving a life. We'll do anything;-) Your the best! Thanks from the lobster too! Great lobster news! PETA had a contact with a lobster release person, she has released over a hundred of them. I paid his bail last night and within one hour he will be with this person and returned to the sea. I made so many phone calls to make sure that what I was doing was alright. Talked with marine biologists and even the seafood supplier of the supermarket. The supplier said that there is no way this lobster was farmed...nobody keeps farm raised for the 80 years that this guy probably was. Said he came from either Canada or Maine. I also checked on any possibly risk of spreading any diseases amongst lobsters and was told that they only can have one disease that was contagious to each other. It was characterized by black spots on the shell....this one had none. So many people have been praying that this guy gets a second chance and he now has one. I can't describe the feeling of knowing that this very old guy is going home and avoiding a pot of boiling water. Thanks for caring. Best, Jeri PS- Was told by the lobster release woman that if, in fact, this lobster was caught in Maine waters, he was taken illegally. Lobstermen have to throw them back for breeding at his size. O MY GOD THAT IS TERRIFIC!!!!!!!!!!!!!!!!!!!!!!!!!!!!!!!!!!! I would like to donate some money towards his release, if you have a paypal account i could send it that way. Just let me know. Many people mean well and want to help but when obstacles are in their way, they give up. Not you! You are determined! That is awesome. I am so glad he is saved. 80 years, that is a long time. I never knew they could live that long. Good for you! Thanks for letting me know. I'll have to tell my mom. Thanks for the offer of deferring the lobster costs but I'm not a non-profit, just a twelve year volunteer involved in wildbird rescue. I usually pay for things myself but am lucky this time because it was my neighbor who told me about the lobster and before anything was done, I told her that I wanted to try and save him/her but couldn't afford it myself. I asked her if she wanted to be "lobster partners" and she agreed. It wasn't that bad.....$90 for the bail and $8 for ice packs. The good feeling I have for having helped him is something that money cannot buy.....I'll be smiling for days. Am going to contact the release person this afternoon to see how it went. Also, one of the supermarket employees has a photo on his cell-phone that he showed me....just awesome.....will ask him if he can e-mail it me and that way I can show him/her to everybody who cared about this rescue. I just got a really nice quote in an email from an animal friend. Its a St. Francis quote (I speak with him alot). Its: "Not to hurt our humble brethren is our first duty to them, but to stop there is not enough...we have a higher mission to be of service to them wherever they require it." I guess that says it best.